Posted 24 January 2011 in Apokolips, Earth, Inter-Gang, Jimmy Olsen #139, Villains. Posted 21 January 2011 in Earth, Inter-Gang, Jimmy Olsen #139, Villains. 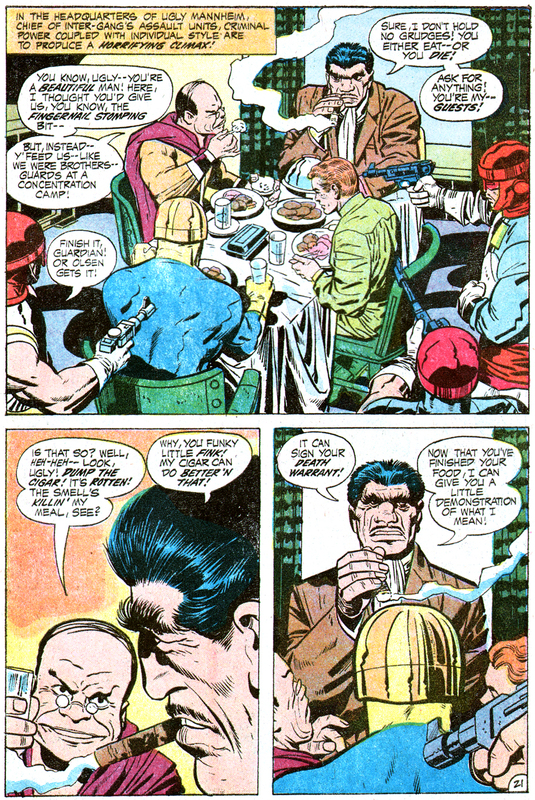 Posted 19 January 2011 in Day Entries, Earth, Heroes, Jimmy Olsen #139, Supporting Characters. 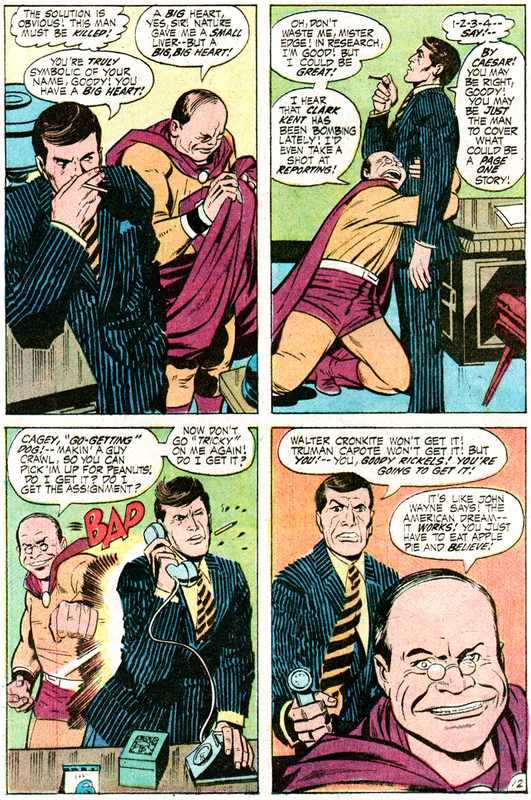 Under the Kirby’s magic touch, Superman’s Pal, Jimmy Olsen goes from the sublime to the ridiculous with the arrival of real-life standup comedian Don Rickle’s “long lost alter ego,” Goody Rickels, a researcher for the Galaxy Broadcasting System who accompanies Jimmy and The Guardian in their tussle with Inter-Gangster Ugly Mannheim. Day 110: Verna & Ray Johnson! 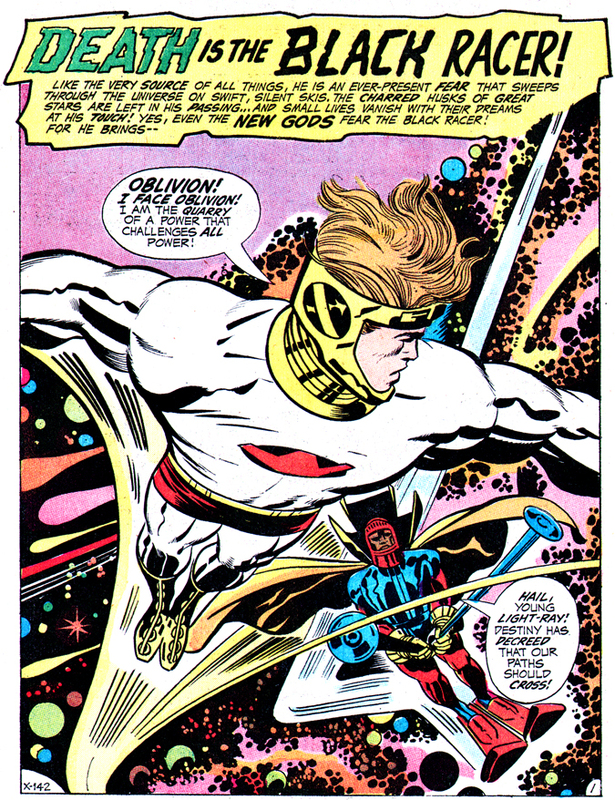 Posted 18 January 2011 in Day Entries, Earth, Supporting Characters, The New Gods #3. Verna: Willie! Willie! Oh, Ray — we shouldn’t have gone out and left him alone! Ray: Willie’s okay! — I mean — as well as he could be! Besides, we arranged for the neighbors to check on him! Verna: They were no help! They were busy with all that trouble tonight! We can’t let this happen again, Ray! We can’t leave Willie alone this way! Ray: Well, who could foresee that they were gonna find a dead hoodlum outside this building? Verna: Willie was here! He might have been hit by a stray bullet! And he can’t move or shout for help! Ray: Yes, Willie must have heard the shots! But I’m sure he didn’t get involved for better reasons than our neighbors! Verna: Well, they’re all excited now! The police are on their way! Ray: Poor Willie! What must he be thinking? In a shabbier district of the city, the gathering clouds of disaster have yet to shroud the sky! Willie Walker lies still as ever! — Unable to move — for all time! Verna: Well! That takes care of your medication for today, Willie! It looks like big sister Verna is doing as well as any nurse! Willie Walker is also forever silent! His eyes can move, but at this moment they are fixed on the distance –! — A distance far beyond his room –! Verna: How do you like that! You’re paying no attention to me at all! I’ll just cut the chatter and say “good night”! I – I seem to have lost him again, Ray! He just doesn’t seem to hear or see us anymore! Ray: Willie’s lost in the stars, Verna! I think nothing here has any meaning for him now! Verna: We’re doing our best for him, aren’t we, Ray? Sometimes I think our marriage suffers for it! Ray: Nonsense! Willie suffered for us in Vietnam! And we’re sticking with Willie — all the way! Obviously we see a pattern here and I wonder where Jack would have gone to expand the formula. Verna frets about Willie’s vulnerability, Ray consoles his wife, and neither are aware that her brother is, for all practical purposes, the Grim Reaper himself. A completely paralyzed character is quite a challenge to flesh out, I should think! Posted 16 January 2011 in Day Entries, Earth, Inter-Gang, The New Gods #3, Villains. But it sure stopped Badger, dinnit? Day 107: Sgt. Willie Walker! Posted 15 January 2011 in Apokolips, Day Entries, Earth, Heroes, New Genesis, The New Gods #3, Villains. Vietnam war hero and wounded paraplegic Willie Walker is chosen to become the alter ego of the messenger of death, The Black Racer. The former sergeant lives in a state of perpetual paralysis in the Metropolis ghetto apartment of his sister Verna and her husband Ray Johnson, bedridden beside a window that is adjacent to a tenement rooftop. 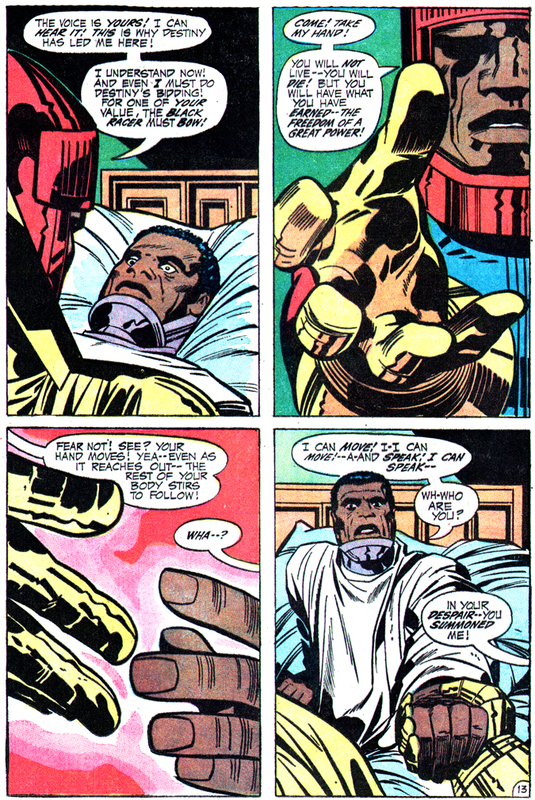 When Sugar-Man executes Screamer in full view of Willie Walker, clad in hospital gown and neckbrace, laying still in his bed, the criminal turns his attention to the possible witness. “Oh-oh! A witness to the bang bang!” Willie has a reputation, at least in the neighborhood, as the assassin exclaims, “Hey! I know you! Sergeant Willie Walker! Big Vietnam hero! Can’t walk, talk — or even feed himself! Lotsa Medals — but one big bad wound, eh, Willie?” Sugar-Man aims his pistol at the veteran but is thwarted by The Black Racer who has been observing the thug. Then begins the transformation. A brilliant glow suddenly flows from the war hero. He understands now. 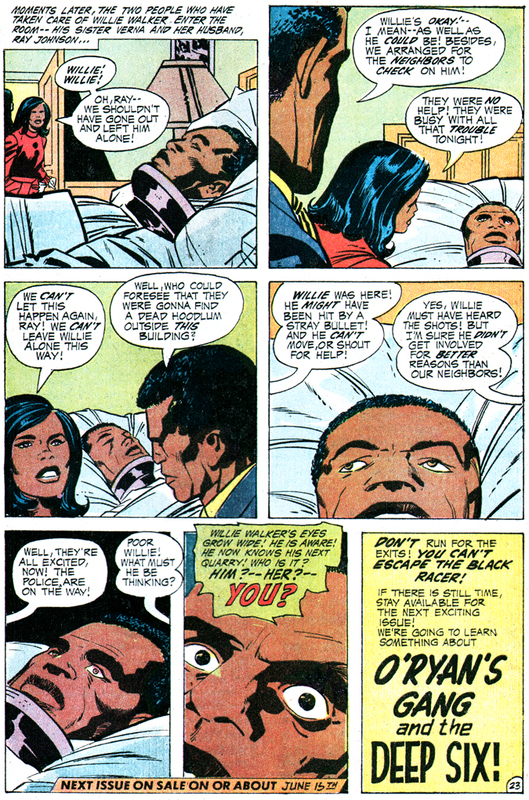 “But the meaning of this, now, begins to dawn on me — I’m changing — I-I am more than Willie Walker!” He has become The Black Racer! Posted 14 January 2011 in Day Entries, Earth, Inter-Gang, The New Gods #3, Villains. 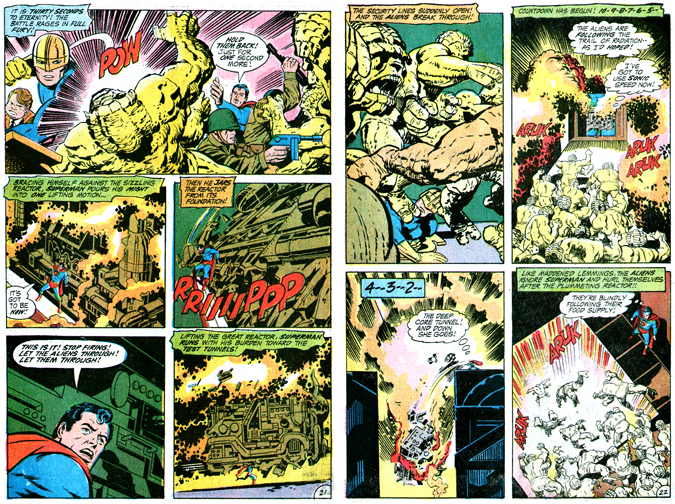 Sugar-Man, running through an enclosed alleyway with the activated bomb in his grip, realizes the identity of one of the assailants laying seige on Badger’s crib. “A cat from New Genesis! We were warned that they might raid us! But they won’t stop Inter-Gang from doing what it’s paid to do!” He runs up to a waiting truck and loads his lethal possession in back. “In you go, bomb! Sugar-Man is gonna make sure you blow!” The truck takes off and the oblivious driver doesn’t know this will be his last delivery. And, apparently, we’ll never learn how this rotten bad guy ever got such a sweet nickname. Just desserts indeed! Day 104: The Black Racer! Posted 12 January 2011 in Apokolips, Day Entries, Earth, Heroes, New Genesis, The New Gods #3, Villains. The Black Racer is the so-called Messenger of Death born of The Source and allied with neither New Genesis, Apokolips or Earth. 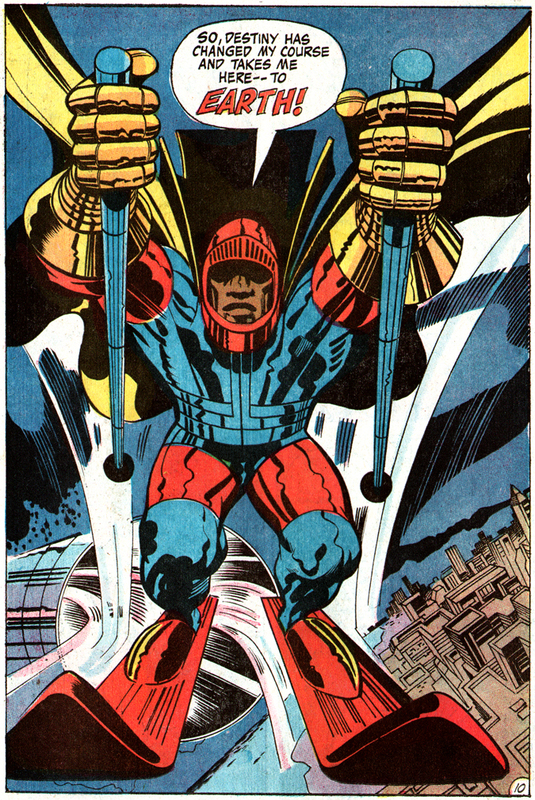 His mission is merely to return his unfortunate and ill-fated quarry to The Source, commanded by a mysterious voice and suited in armor complete with a set of skis and ski-poles. When called, this god-like Dark Bringer of Death rides the spaceways, often at the speed of light to complete his grim missions. To be touch by The Black Racer is to die. Lightray: Oblivion! I face oblivion! I am the quarry of a power that challenges all power! The Black Racer: Hail, young Light-Ray! Destiny has decreed that our paths should cross! The flotsam of the universe cannot hide you! I am as swift as you are! Lightray: But not as eager as I am to avoid your touch! As the consuming flame leaps at him, The Black Racer leaps even faster! The Black Racer: Foolish one! Was it not told to you on New Genesis of The Black Racer’s superb agility? You cannot escape me! Lightray: [Thinking] He is right! Though I fly at the utmost speed of light, he easily paces me! — Toys with me — but I shall not stop! I dare not stop! The Black Racer: Your time has come, young one! I am no respecter of tender years! Prepare for my touch! Meanwhile, in the vast wilderness of stars, a giant, new sun flares into being!! Lightray, in a final burst of desperation, spends his remaining energies by exploding a filed of drifting matter to block his pursuer!! Lightray: This must do it! This must halt him — and give me time to escape! But from its flaming heart emerges death! The Black Racer is more than powerful! He is relentless… unshakable in his purpose! Lightray, mustering his failing strength, does not see the planetoid coming in his path! Lightray: [Thinking] Can’t give up! Must escape! He strikes its harsh surface with damaging effect! The Black Rider: It is the end, Lightray! It could only end this way! In a grandiose, full-page splash that follows the Messenger of Death bursts forth into the skies of Metropolis, exclaiming, “So, destiny has changed my course and takes me here — to Earth! The sound of deadly weapons reaches me! I sense that this area is ripe for my arrival! instinct guides me to my quarry!” Gunshots ring out! The Black Racer is gliding above the littered streets of the city’s black ghetto. “There, below — a place of black men! 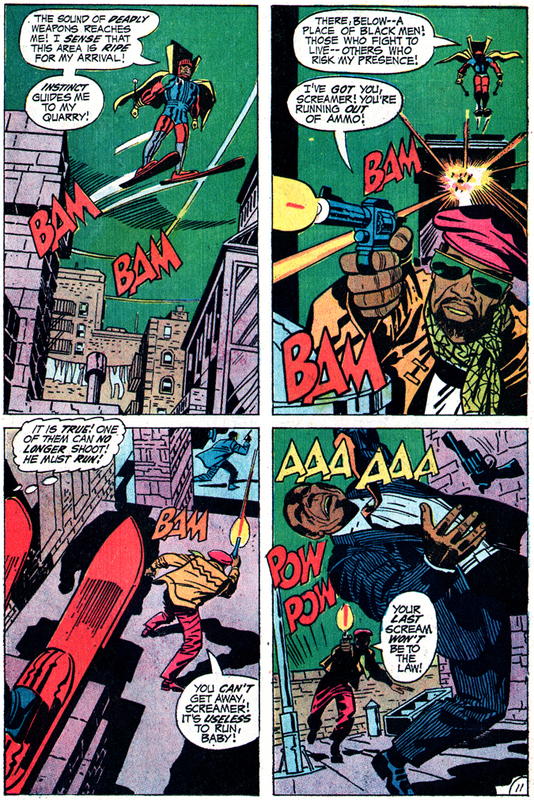 Those who fight to live — others who risk my presence!” We see Inter-Gang criminal Sugar-Man engaged in a rooftop gun battle with another bad guy. “I’ve got you, Screamer!” boasts Sugar-Man. “You’re running out of ammo!” The god-like being thinks, “It is true! One of them can no longer shoot! He must run!” Bullets ricochet off chimneys as the Inter-Gangster closes in for the kill. Sugar-Man taunts his prey, “You can’t get away, Screamer! It’s useless to run, baby! Your last scream won’t be to the law!” With that, Screamer falls, now eternally silent. The Black Racer: In your despair — you summoned me! Sgt. Willie Walker: Why don’t you answer me? I’m scared! More scared than I ever was in combat! Good Lord! I’m standing! This can’t be happening! What am I saying! It’s happened! I’m whole! I’m strong! I’m no longer half-alive! Willie Walker no longer needs this aid! The Black Racer: And so the chase begins! Faster, Sugar-Man! Go faster! We are linked in a moment of dying! Sugar-Man: That reflection in my rear view mirror — I’m being followed! That clown’s not from Earth! But I’m not stopping to find out which side he’s on! 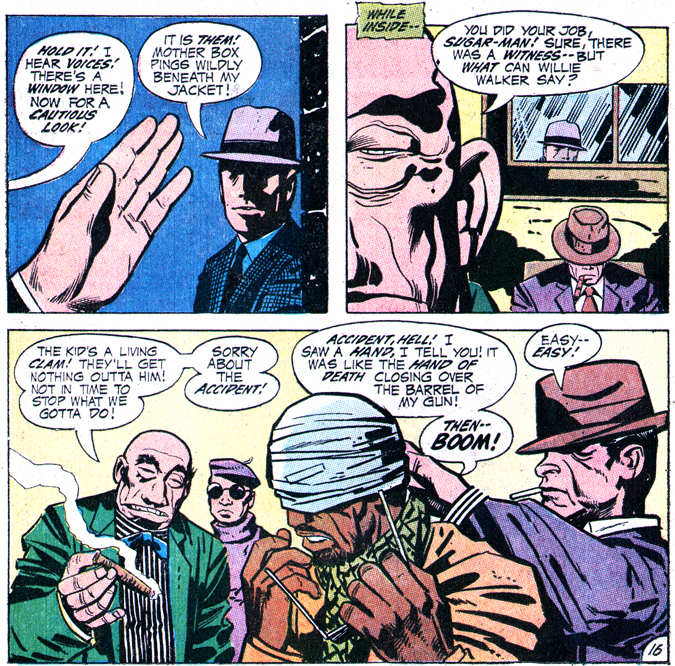 The Black Racer: You know me, Sugar-Man! You’ve sent many to The Black Racer! Sugar-Man: I do know him! It was him — standing in the shadows on that roof — when my gun blew up in my face! The Black Racer: Your luck has run out, Sugar-Man! Listen to the song of death! Inside the truck, strange, electronic sounds rise to a strident pitch from the activated bomb! But he is there! Swift! Silent! Present at the finish of a man — or a god! Even stranger is his destination! When he makes his descent, it is in the humblest of places — the ghetto district! Ahead of him is a tenement of fading brick! Then a wall! Then — a window! Without hesitation, he enters, through material barriers that are not for him! For a moment, the room is lit by a blinding flash! Then — it’s gone! Sergeant Willie Walker has come home! Where but in the hands of a paraplegic, made helpless by war, would a wandering, god-like being have placed the most awesome power? Verna: Willie! Willie! Are you all right? How did these fumes get in this room? I’ve taken all precaution against fire! Under the constant care of his sister and her husband, who would suspect that Sergeant Willie Walker is The Black Racer, Messenger of Death!? Verna: [Thinking] But how could this be? –A messenger of death –!! With powers beyond the standards known by men! Powers that can make an invalid rise and stand firm with new strength! Voice: On your feet, Willie! You can do it! That’s it, Willie! The change is coming! Even as you stand, the change is taking place! Where the commanding voice comes from is a mystery to Willie! He only knows that it changes him! And with that change he is given a grim mission! And a new name! The Black Racer: Once again — I’m The Black Racer! The Black Racer: My equipment lies waiting! My mission begins!! Death is on the wing this night! —Death for an angry god! The Black Racer: The time is at hand! 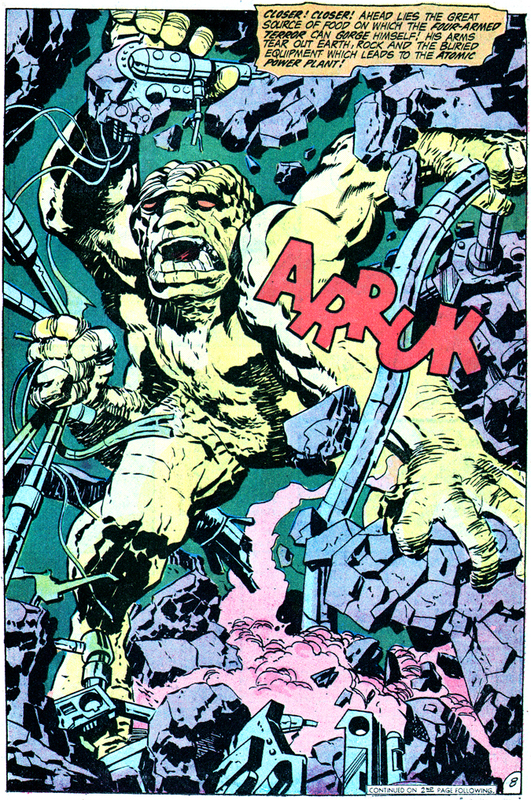 Then, as Orion lifts Kalibak for a last crushing act of violence, he sees The Black Racer rushing toward him! The Black Racer: Death approaches, Orion! Both of you have taken incredible punishment! But I’ve come for only one! Orion: If it be me — then come and be swift! There’s no stopping The Black Racer! Orion is struck by a fierce wind! And every fiber quakes and screams in the shadow of what overwhelms him! Orion: [Thinking] The Black Racer spared me! 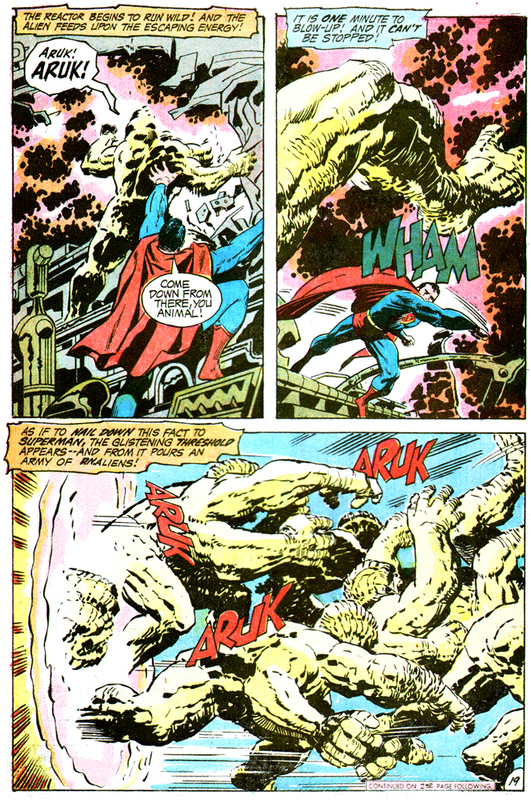 It was Kalibak’s moment of dying! — not mine! Dave Lincoln: Orion! What was all that? Where is Kalibak — and that guy on skis? Ye ghads! What a climax and resolved on the very last page of the final issue of The New Gods, at that! There is one other appearance for the character, during a “Young Gods of Supertown” vignette starring Fastbak entitled “Beat The Black Racer! !” Fastbak, as we previously learned, flies the skies (and apparently spaceways) courtesy of his phenomenally quick “Aero-Pads.” In this adventure, we see him in space about New Genesis as a lethal ski pole advances toward him. The Black Racer: Greetings, Fastbak!! You face a difficult challenger this day! Fastbak: The Dark Bringer of Death! [Thinking] Young Esak is missing –! And The Black Racer is a sorry clue to his situation!! The Black Racer: Destiny has sent us on the same mission, Fastbak!! Life or extinction!! — It depends on which of us reaches our quarry — first!! A race to the death! Fastbak had guessed as much from the start! Fastbak: [Thinking] My new circuits check out! I hope they do their job well! They do well — enabling Fastbak to elude the fatal rush of a meteor swarm! Apokolips has turned space into a great trap for New Genesis life!! It’s littered with dangers like the great Terror-Bats which pursue and kill!! Then there are the roving patrols of fierce Para-Demons! Para-Demon: Close in on him! Don’t let him escape!! But stopping Fastbak at his blinding speed is like trying to halt a dodging missile!! Fastbak: Out of my way! Fastbak whizzes on!! He know that the most sinister space-trap of all is the Magna-Target which holds its prey and pulls it toward Apokolips — where it can be shot down and destroyed!! Fastbak: Just as I thought! The victim on that Magna-Target is young Esak! The Black Racer: He was ever curious! As curious as Metron! Fastbak: [Thinking] The Black Racer! I thought I’d lost him! The Black Racer: The Black Racer catches up with everyone, Fastbak! The Black Racer: One of us must claim him! Fastbak! Fastbak: I’ll do it! I must do it! 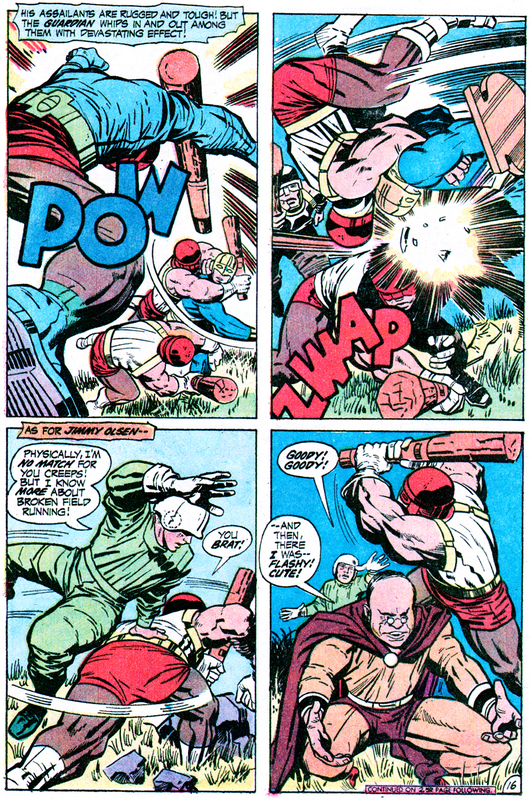 Fastbak: The weapons of Apokolips have spoken! Their target is destroyed! But not its living prey, Esak!! Esak: That was fantastic, Fastbak! You outdid yourself! The Black Racer is nowhere to be seen! But he’ll return again!! He’s neither lost nor won! — But merely thwarted for a time!! Day 102: The Dimensional Threshold! Posted 10 January 2011 in Day Entries, Earth, Jimmy Olsen #138, Weapons & Devices. We’re not exactly informed how The Four-Armed Terror is transported from the Evil Factory (hidden in the Scottish highlands) to The Wild Area (near Metropolis), as it happens between Superman’s Pal, Jimmy Olsen #136 and 137, but we kinda assumed it was the Penetrator Beam that did the job, the same device used to land Giant Green Jimmy in The Project. But actually, at least when it comes to multiple Homo Ursurpui, Mokkari and Simyan utilize the Matter-Transmitter to create the Dimensional Threshold to get the buggers out of their hair. At an unknown location, the architects of the atomic blow-up work feverishly in the Evil Factory! Simyan: Those troops could help Superman stop our alien, Mokkari! With that, the yellow-faced Apokolips denizen fiddles with some dials. Simyan: Our entire alien brood has hatched — and dissolved their shells! Mokkari: As soon as the generator builds up the desired charge, we’ll create the Dimensional Threshold — and transmit them across it to the scene of action! Amidst their cries of “ARUK,” the Four-Armed Terrors are sprayed with magenta-colored gas, perhaps more radioactive vapors. Simyan: And when they get there, nothing will stop them! They’ll tear into that atomic reactor! The blow-up must happen! Mokkari: It shall! These brutes will make it a certainty! We must report to our ruler that we’ve done his will! Suddenly there’s a glowing area in the chamber… the Dimensional Threshold begins to appear!